At Barona Casino near San Diego, CA, they deal ShuffleMaster’s Mississippi Stud face up, where you can see the other player’s hands. This info helps the players odds considerably, and for a full table, the player actually has a small +1.5% edge over the house. While this is much better than the normal 4.91% house edge, there’s not always a full game going, the hand rate is slow (max 40/hr), and the variance is high. So don’t expect to be able to grind out a profit at this game, unless you have a large bankroll, and a bunch of friends to fill in the empty seats. When I play, I use a Simplified +EV Collusion Strategy that still yields +0.5% against the house. For updates, check all my posts on on +EV Mississippi Stud. One cool aspect of the game is that standing players can bet behind seated players, and they can make independent decisions of the seated player. This is key, since I only play at a full table (my strategy requires 6 players). This helps keep the critical mass of the game going. If a seated player leaves, another one is right there to take his place, and keep the cards and info flowing. The improved strategy based on knowledge of all dealt hands is listed in my post Mississippi Stud @ Barona Casino, CA. Mississippi Stud strategy table when all 6 hands seen. You don’t need to actually see all the player hands to know exactly how many outs you have. Most places will allow you to discretely discuss your “outs”, so you should be able to make the game +EV for yourself. I noticed that this strategy card doesn’t have the 3rd street call for 3 high outs, wheel draw, and three low outs, nor does your Java game. Is this still part of your strategy? Thanks. Thanks for the heads up. I fixed the A w/ wheel cards draw on 3rd street in the game and the strategy table. I also fixed a few other points, and the game now simulates at +1.4%. Stephen, Love the site. I am planning a trip to Barona this week with 5 or 6 people and playing Miss Stud. Terry, on 3rd St (the 1st bet), you lose 5% of the Ante if you fold 3 mid and 3 low outs. (See my EV chart for common decisions.) Also, the hand is worth more if there are 2 or less high cards showing, or if your 3+3 hand has plenty of straight outs. Good luck on your trip! Tell us how it goes. Betting a small pair with all your trip outs remaining on 3rd St is worth 60% of the Ante more than just 1x calling. On 4th St, you gain a little by 3x betting a small pair with *all* your outs remaining (i.e., all your trip outs, all your 2 pair outs). But, as I remember, it’s a very small edge, so 1x betting here is ok.
Don’t forget, Caribbean Stud plays well with a team of 7. I updated my analysis, and found the edge is actually about 1.1% for a full table. I am sorry to hear that you are barred at Barona. Small minds bring small ideas. I enjoyed your presence on a table. Stay in touch. Gary H.
I think this is the best game ever, you just have to know when to fold and when to hold. It’s really hard to get a flush and straight in the real game. But 3 of a kind and pairs are okay if you got money to pay with. I like the pay odds. I either win big or lose a lot. I play in MS.
Would love to see basic strategy for seeing two other hands, which is more common down here in MS. If I hold J3o and I see another Jack do I play? Or I hold 68o and so does my neighbor, what then? Big tip: Give yourself a goal. Whether its winning $200 or doubling your money, once you hit your goal GET UP AND GO!!! I have had several winning sessions that ended up costing me some cash because I did not follow this rule. It gets too easy to pay to see the next card 6 hands in a row. But man I love this game. Stephen, when is the next time you’ll be up there? I agree with you … hit and run with this game. However, I don’t like the game that much. I tell my friends it’s the “least fun +EV game I know”. It’s pretty aggravating when you don’t hit anything. I might look into perfecting some aspects of the advanced (collusion) strategy. Is the game full on week nights? I can see why you think it’s boring lol. Sometimes it gets full at nights. I may head up there tomorrow and see what its like. The best bet though is weekends. I may hit up Viejas this next weekend though. They will have an ace with a non-playing card 5 or below and chase it to the end yet if they have a jack and a low card they fold. Does Harrah’s allow face-up action as well? Went to Harrah’s Rincon Sunday. Lost about $300 before I hit. Did well. A word to the wise. KNOW the rules. Wife said let me do it I know how. She had a pair of sixes . $5 ante so she bet $5 for first card instead of three times (I was on oppoisite end of table) a six comes up and she bet $5 Bottom line is quads came up and she lost out on $800 because of wrong betting. You should’ve divorced her then and there! BTW She hit quads 3 times in 2 hours. Did better on the other 2. Heading to Barona tonight. Hopefully I’ll hit a Royal! I’ll be happy with a full house though lmao. Anyways, good luck to all this weekend. started at $5 ante and got up to $25 playing with winning $$. I have to say it’s quite a rush playing with green. You learn not to chase REAL fast. 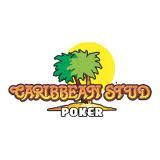 ARE THERE ANY ON LINE CASINOS THAT OFFER MISSISSIPPI STUD? Played for the 1st time the other day in ms. Hit 4 9’s. $4000. I’m hooked !! In Ultimate, if the dealer pays your play bet when they don`t qualify, even if they have a higher hand,how much would this change the house advantage? It’s be huge, but it probably won’t last. Is this a long-term opportunity? It is dealer dependant.So far 2 dealers who do this. Any strategy changes you could suggest for this. Played MS at Harrah’s yesterday. Got down to $800 in the hole after a few sessions and finally got it all back in about 45 min into my last one.. I see a lot of players leave after just a few bets. LONG sessions but usually do well. The wife played one 8 hour session and only won $200. Unusual not to hit a big hand in that time frame. I used “monte-carlo” analysis (i.e., random simulation of hands satisfying a proposed hypothesis) to develop individual decision points of the collusion strategy. I constructed a complete strategy (all hand classifications and decisions), coded it up, and ran it for billions of hands. First, I verified the baseline simulation that basic strategy (no collusion) returned the expected -4.91% EV. Then, I substituted in the full collusion strategy, and observed the improved return. This type of simulation is the least susceptible to error, because there’s no way to “cheat”, other than through collusion information. In other words, the baseline -4.91% simulation guarantees the +EV collusion strategy must be the result of the strategy, not any bug in the programming. just curious, the practice game pays 5:1 on straights. but the wizard of odds lists the payout as 4:1. what payout did you use for your analysis? thanks! The paytable pays 5-to-1 for a straight at Barona. It’s the first table I ever saw, so I thought it was standard. But as usual, Barona has the best paytables, and everyone else pays 4-to-1 for the straight. I used 5-to-1 for the analysis, so it’ll probably change the 3x decision points for a straight draw. Eventually, I’ll get around to updating the analysis for the more common paytable. The house edge for a game with 4 to 1 on the straight is 4.91%. So barona’s game of 5 to 1 on the straight is only 3.97% house edge. This could change your +EV numbers a bit. Ahhh … I’ll have to correct the baseline EV numbers for the 5:1 straight paytable. But I already have the 5:1 paytable in my collusion analysis, so my +EV numbers stand as they are. Did you ever update the analysis for the more common paytable? I’d like to play this game but have no idea what the ev is playing at the 4-1 payoff for the straight. PS – Please email me. I’d like to mention something to you privately. (Not necessary to post this message). I’ve been wanting to check the effects of betting all 6 hands on EV and variance as you point out. I’ll get around to it soon! Had a great day at a casino. Don’t want to get anyone in trouble so name withheld. Had one dealer kept flashing community cards. A few times he actually dealt all three face up. He had been dealing another carnival game prior to this. played all day on their money as I hit good on my first buy in. Had one boat with $100 down. Ended up $2300 ahead. Been to Harrah’s 3 times so far this year. Got my win/loss statement and it is way off. They are not keeping a count in the pit when you buy in. I suggest when you go to MS you buy in at $300 increments. They usually check that. $100 not so much. Im thinking of flying out to Barona to play Mississippi Stud. Can someone tell me if game at Barona is still dealt face up, as of February 2012? And are the tables usually full? Full on weekends or weekdays? A casino i visited had ultimate hold em. It was never full. I promise to share results and pics. Im a lkmg time part time AP. Thanks! Yep, it’s still there, dealt face up. There’s one table, and it gets completely full on weekends. If you want to sit and play, make sure you get there by noon on Saturday and Sunday. Otherwise, you’ll have to play standing up (betting on the secondary spots for standing players), and might have to stand for a few hours before getting a seat. Often, there are 2 or 3 standing players waiting for a seat. During the week, it’s hit-and-miss, though it usually fills up by 7/8/9 pm. On weekends, the game goes full until the wee hours of the morning. Sometimes it goes on until 7am. Your site is bad assets! Congratulations. I hope you grow. Your gaming philosophy is a lot like mine. Is there a maximum bet that i should make? what I mean is that tables often have a max payout, and any bet over will be shorted in the event of a royal. Is there such a limitation on MS? They used to post a sign stating a $125,000 max aggregate payout, but that was a long time ago. Now, there’s no stated max payout. But I’d check with the floor before playing anything more than a $25 Ante (you’d 3x all the way on a Royal, and win $125,000 on a $25 Ante). I have a feeling if you bet $100 Antes, they might not pay out $500,000 on the Royal. Been a while. Not stopping at Harrah’s now? I should make the drive, Wife has a hard time. As much time as we spend at the table (10 -120 hours) I should make the drive. like to see you again. Let me know if you will be at Pauma or Harrah’s. HEY!! Why did they bar you? I think they were afraid I’d treach people how to take advantage of the face up info. They warned me a few times to play quietly. I pretty much did, but they really didn’t like when I posted the Mississippi Stud Calculator. In their view, they didn’t have any choice but to bar me after that post. I have no problem with their decision, because I was playing waaay too many hours each week, and they gave me plenty of warning. But I’d rather be barred than be censored. Anyway, no matter what I post, say, or do, no one is going to play optimally. I don’t think I had any influence on the hold (house profit rate) of the game, except maybe for plugging up a seat for 12 hours at a time. They have 12 betting spots on the table, so if my spot didn’t contribute to their profit, most of the other spots did. I don’t think you’ll get any heat over there, unless you bring in a full-time team, and you’re all locking up the table all day with a bunch of rocks (poker term for tight player; aka “pikers”). Stephen, Maybe you just answered my question when you stated you were barred. But, is there heat at the Mississippi stud game? I can’t imagine that they would allow a game with a 1.5% player edge. 1.5% is huge! If you see how some people play, you’ll understand how they make more money from that game face up, than other houses do face down. They have 12 betting spots on the table, and as I discussed in several posts, people tend to play a lot looser face up (i.e., give up more house edge) than normal. Thanks Stephen. Congrats on this site. I hope you grow large and make lots of money off of it. We have needed a site like this. I am a regular reader of Wizard of Vegas. Thanks for sharing. I will be coming to Barona. If you want need a team member for Caribbean stud, email me. I will probably come late February. It should be possible to each keep his own kill, so I’m down for a team! I intend to play $25, which is the full bet for a proper max payout. Anything over $25 will be sorted on the royal. Am I right? Table max payout of 125k. If i bet $25 a hand on the ante, will the casino comp me as a green chip bettor? Or will they not comp me based on my skill play? Since MS has a high HE i figure i should get a free room. The wizard of Vegas states Barona is very generous with their comps. Hopefully they comp me like a green chip bettor who is losing to a HE of 5%+. What is your thinking on this? Ordinarily, they’d comp you straight away if you’re playing green chip MS. But who knows, if they’re on the lookout for advantage players, then you may not. Anyways, I assume you’re willing to expect swings up to $5k playing like that. You’d definitely be the biggest player at the table (unless Gary is there). $5000? that’s not a swing. that’s a walk in the park. lol. I swing $20,000 at craps all the time. I would bet blacks at MS if I could. I am playing double $10 on MS and get nada in comps. Thats in a 12-14 hour day. Wife $5 same amount of time. They know us so we always have a comp for food any time we ask. Not taken from points. I see players ask for comps for food and they just swipe their card and give it to them from their points. Table game supervisors can give you comps from their account. Like I tell my wife. Why worry about a $40 food comp when your playing $40 a HAND at the table. Play for $$$$ not comps. I am still a little confused about the chart for MS. For example, on one hand I was dealt and offsuit J4. I had 2 high outs and 3 low outs. The chart said to call 1x (if I read it correctly). But the program/game you have told me to fold. Am I reading the chart correctly? 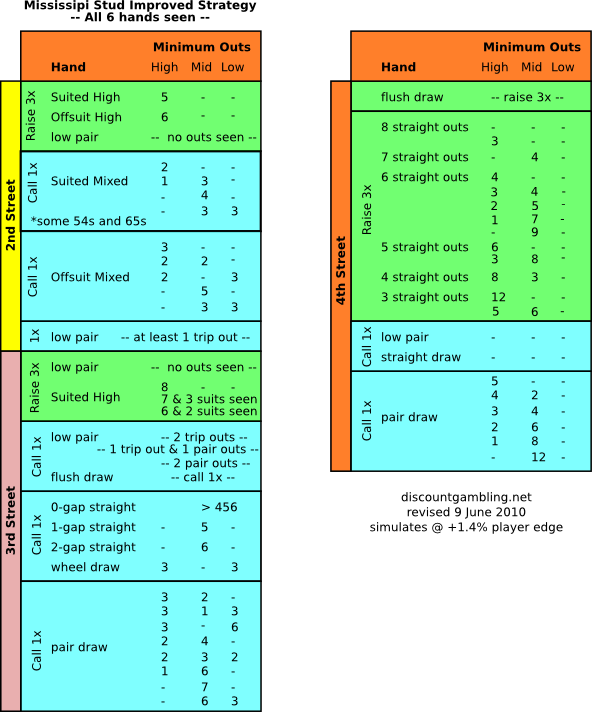 The 3rd Street decision for an offsuit hand with 2 high and 3 low outs is a borderline case. This is when your high card is “copied” once, but you still gave all of your low outs. Normally, I fold this hand, unless there are only 3 or less high cards seen among all hands. In this case, the possibility of the board pairing with high cards makes the hand EV a little better than -1 (folding). I’ve written about this before, but it’s something you’ll see for yourself with the calculator. I’m confused again. I was dealt a pair of 5s (5,5). The out count showed that I had 0,0,0 outs (I am assuming that the remaining fives were dealt to the players). But the in game hint, in the betting circle, told me to triple raise. The hint on the left side said, verbatim, “3x raise with all trip outs”. I don’t understand. Do I have zero outs, or do I have all my trip outs? The out count showed that I had zero outs. So I went with the recommendation and raised 3x. Guess what was dealt third street? another 5. Giving me a set of 5s on the third street. Why did the counter say I had zero outs? Stephen, I sent you an email with the pic of the screen to show you what I am talking about. If the game said to 3x, then both fives were still in the deck. (The hi/mid/low out count is N/A when you have a small pair.) Sorry for the confusion, but the hints always follow the 6-player collusion strategy correctly. I came across your site and love the information. I have some questions I hope you can answer. I want to form a team and “move in” at barona until we get barred. Assuming they have no max payout limit, and I fill six seats while betting $100 on the ante (theoretically playing $1000 on each spot), what size bankroll would I need to make the 1.5% profitable? Also, If they do have a max payout (let’s say $100,000, to make it easy), what size bankroll would I need by only playing a $20 ante? I would like to play at other joints too, but barona makes it so easy for us with the face up game. Thanks. “Chuck” — see my latest post in reply to your bankroll question. Thank you for your quick and impressive reply! 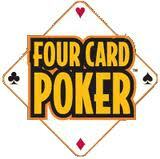 It looks to me that if each player has a $20,000 bankroll, playing $20 antes, then they should win $1,250 on average. The 6% risk of ruin isn’t too bad, but the 50% chance of a loss isn’t attractive. I wouldn’t even try to play $100 antes since the tailwind of big payouts would be reduced if there is a set max payout. Plus, think of the heat we would get! Thanks. I’ll be at the table with the wife when it opens tommorow at 10:00 AM. I normally chime in on the UTH thread, but had to post here when i saw Stephen got barred from Barona!? playing nickels!? is MS that good? i got my rear handed to me the first time i played…then again, i had no idea what i was doing. i just may have to consider switching from UTH to MS.
Stephen, where do you play now? I am still unsure if I have ever played UTH with you before. through the information in your blog, you have definitely made gambling more fun and challenging for me. I would definitely like to play at a table with you one day…just don’t get me barred with you…lol! Mike. MS is Real good wen you hit. Wife and I played for 10 hours at Harrah’s Rincon and lost $3500. LMAO now has a new meaning for me. It’s LOSING MAO. to some of us LOL could mean Losing Out Loud when the F-bomb gets dropped. I played the simulator last night and after losing 2k playing quarters, I decided to play 50 a spot…3x, 3x, 3x…hit quads for 20k. started playing 100 spots and quit when i got up to 37k. wish that was real money…lol. it was fun, but it really seems like a game for those who like to bet heavy on the UTH Trips bet. I will be going to vegas at the end of March for a BJ tourney at TI and the MJ Celebrity Golf Tournament at Shadow Creek. I may have to head over to Harrah’s and try this game one more time during this trip. Unrelated to this, but does anyone have any pointers for a first time BJ tournament player? Also, I might have an extra ticket to the Michael Jordan event…will know for sure in a couple weeks. The tickets are from ARIA Casino Marketing, so if any of you received the offer too, you might want to hurry up and call before they run out of tickets. Gambling should be avoided and only played for entertainment like seeing a football or baseball game. Anything more than 5 hrs a week I think is a waste of valuable time. Just my 2 cents. Nothing wrong w/ gambling but speaking from experience I think we can spend to much time and I think we should all set TIME limits not just MONEY limits. Stephen – Great work again. So I was playing at Barona and there is no sign stating max payout. I asked and no one got back to me. The reason I asked was because I bet $50 ante, called called and raised 3x for the open ended straigh/royal flush draw. Ended up being a straight, otherwise royal SHOULD have paid 150k. I’ll try to get a definitive answer next time. Also because of my play I got bumped staright to platinum haha. Nice talking to you at the table yesterday. I got my money back plus some. 12 hours at the table as was the wife. Great Blue Heron Casino NE of Toronto just intro’d MS. Wish I would have read this first, went down 500 before bouncing back to -250 as I figured out how to play…and that was hitting nothing but the odd 2 pairs and high pairs on first street. The cards are dealt face down but table talk is tolerated…with the older crowd the trick seems to be convincing your neighbor to show his/her cards. One dealer was placing the community cards in a way that they could be somewhat reflected off a metal surface if you were in the right seat. With MS they have a max payout of 50k — so inferring from the math here, more than $10 ante would be ill advised. This place also has 6 deck BJ with stand soft 17, late surrender and double after split — pretty much all the player friendly rules. When one of those tables opened I ditched MS to go count cards…but plan to return after reading the info here. We play MS in Tunica, Mississippi at Hollywood, Gold Strike, and Horseshoe. Cards are dealt face down; the casinos are quite strict about discussing hands, but the degree of enforcement depends on the dealer. Some players next to you hide their cards as if they were playing against you – which is silly – but about half will let you take a glance. If you are dealt K5, you can usually say to the dealer, “Come on, Cowboy!” but not “Come on, King-five!” So a little discretion is allowed until it gets out of hand. I appreciate this site, and hope one day I can find a casino in the Southeast that deals the cards face up! Been having ups and downs. Hit $1800 on quads and went back last Wed and dropped $100. That’s funny. Usually, it’s the other way around when we’re all playing card craps @ Viejas. I’ll be on the Don’t Pass, and the count will get really good for the point. I’ll take off my odds against the point, and sincerely say, “Good luck 9” (or whatever the point is). Immediately, it seven’s out, and I look like an a*hole. It’s like a joke now — I’m a counter-indicator of “luck”. Headed out tomorrow to Harrah’s again. Here is a link to an interesting article. WOW!!! What a day at Harrah’s. My wife hit 3 boats in about two hours. A little later she got quads followed by another boat next hand, She got several strts and a coupe of flushes. I hit 4 boats also. Saw a player hit a royal on UTH while I was at MS.
Table game supervisors were amazed. All in all the table payed off a lot of players yesterday. Left a lot earlier to come home than I usually do. – 1.5% is with the condition of the game on 6 boxes? Tell me please, if you play optimally on 4 boxes, how much player get? I’ll make an updated post on team play for 4 to 6 boxes. But yes, you’ll have an advantage for 6 boxes. We’ll see what 4- and 5- boxes yields. And most importantly, I’ll run the numbers for the most common pay table where straights are only paid 4:1. I apologize for my English, I write through an online translator. Thanks for the answer! It would be interesting to look at the results. I have a question on the analyzer (calculator). 1. I can not understand why there 1x EV is different from 3x? Do EV% is considered a resignation not a percentage, regardless of its size? what if you are playing with 3 players and can see their cards–what does that change? The game is only +EV for 5 players or more at Barona (all hole cards seen). Hit Harrah’s for a few G’s Thursday on Mississipi. It seems I hit good every time I play one on one. WinnaVegas at Sloan Iowa has MS for a 3-month trial. They use hand shuffle. In the past 2 months, Straight Flush get hit once every month and the payout was $10,000 each time. (Perhaps the Ante was $10.) What is the hit rate for Straight Flush? It seems to easy to hit. Does this present an opportunity for AP in this casino? I noticed that these strategies are specifically for plying with 6 players. Is there a way to easily adjust this to other numbers of players? So if another person came to the table or if someone left you could still be optimizing your playing. I was wondering the same thing. Because most of the time I can only see the cards next to me, so only 3 hands instead of 6. But there is still the advantage of paying attention to how people are betting first 2 cards after they have turned over. I’m guessing it is about even pay game with these stated attributes. What thing I hate about playing is people hiding their cards like they are playing against everyone. I just don’t get it.